SAN FRANCISCO, Calif. & SINGAPORE--(BUSINESS WIRE)--Apr. 27, 2016-- Visa Inc. (NYSE:V) today announced the opening of its Singapore innovation center, the first in a network of new regional innovation centers that Visa is launching globally. The new 7,000 square foot Singapore facility will serve as a destination for clients, partners and developers, across the region, to work alongside Visa experts and jointly create the next generation of payment and commerce applications. This builds off the success of Visa’s flagship innovation center, One Market Center, which was opened in July 2014, and is located at the company’s headquarter in San Francisco. Additional innovation centers will be opened in other regions later this year, and in 2017. Accessible to both local and global clients, the new Singapore innovation center will provide Visa’s partners with access to Visa APIs and software developer kits (SDKs) available through the company’s Visa Developer Platform. 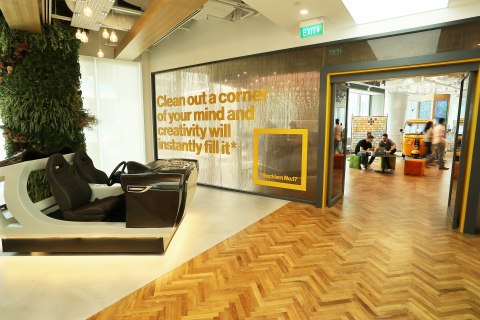 A hands-on, real-time work space staffed by Visa technologists and business leaders, the center will operate as a commercial gateway, helping Visa’s partners to build market-relevant solutions that extend their service offerings into Asia. According to Accenture, fintech investment in the Asia Pacific region has increased significantly from an estimated US$880 million in 2014 to nearly US$3.5 billion in the first nine months of 2015 -- with 40 percent of investment deals specific to payments*. Engage: The center’s immersive environment provides clients and partners with everything they need to work on new digital solutions -- in a physical space designed to encourage dynamic interaction, real-time experimentation and rapid prototyping. Experience: Visa emphasizes a human-centered design approach where product development is customer-focused and delivers real benefits for users. Collaborate: Clients and partners can interact with Visa payment experts and access Visa technology. This includes APIs and SDKs available through Visa Developer Platform. * Source: Accenture, November 2015, “Fintech Investment in Asia"